A 2015 study by Rene L. Olvera and colleagues in the Journal of Clinical Psychiatry indicated that among 1,768 Mexican-Americans living along the border from 2004–2010, 30% were currently depressed, 14% had severe depression, and 52% were obese. Women were more likely to be depressed, and more likely to have severe depression. Other factors making depression more likely included low education, obesity, low levels of “good” cholesterol, and larger waist circumference. Low education and extreme obesity were also linked to severe depression. 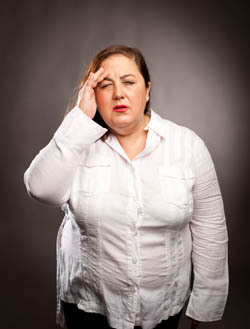 In a commentary on the article in the same issue, researcher Susan L. McElroy wrote that “the medical field needs to firmly accept that obesity is a risk factor for depression and, conversely, that depression is a risk factor of obesity.” She suggested that people with obesity, those who carry excess weight around their middles, and those who have related metabolic symptoms such as poor cholesterol should all be evaluated for depression. Likewise, those with depression should have their weight and body measures monitored. People with both obesity and depression should be evaluated for disordered eating. The researchers collected information on the incidence of myocardial infarction (heart attack), arterial hypertension, and stroke among the women. Over the 16 years of the study, 2.2% of the women had heart attacks and 5.1% had strokes. Women with depression were 2.53 times more likely to have a heart attack and 4.63 times more likely to have a stroke than women without depression. Among women with average education levels, married women with depression were more likely to have heart attacks, hypertension, and strokes. Hypertension was more likely among women who worked as managers or light manual laborers.